This poor blog has been neglected for many months. I’d like to say it was all down to the demands of the day job, but I have to admit there has also been a bit of blog-boredom mixed in. A sense of tedium developed after the very frequent posts and following the rush of fleeting notoriety of last summer, so I thought I’d cut back for a while. Then the Xmas hols came, and though they included some significant tastings, I didn’t feel much urge to write up my notes into proper blog posts. Some work-related travel -- mostly to places not known for great beer -- then dominated my life at the beginning of this year. For the last month, I’ve been on sabbatical, but before you say that should have freed up some time to work on the blog, think again. I’ve been on an intensive French language course, and there’s been precious little time to discuss beer with all those verbs waiting to be conjugated. I’ve even tried to get some guest contributions from friends, but that’s not quite worked out either. Yet. Still, all the while I’ve been receiving beers to review from breweries and from friends. About two cases of bottles has thus built up and demands my attention. So, now that I’ve just taken my first French exam, it’s time to celebrate (or sink into depression if it turns out I didn’t pass) with a new beer and some tasting notes. 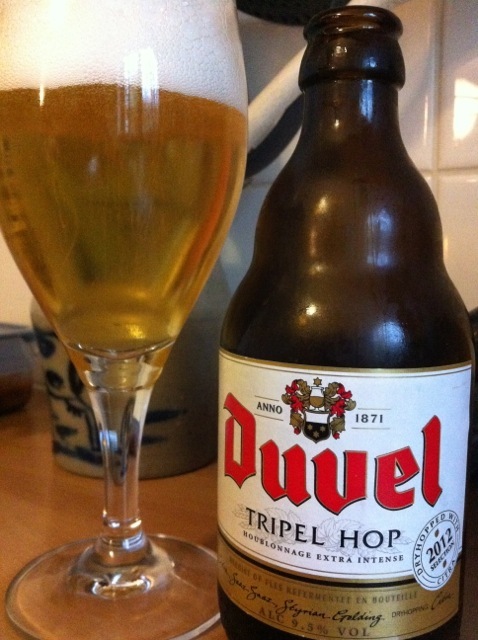 There is perhaps no better beer to start with than Duvel Tripel Hop, a delightful surprise in every way. Those who know my peculiar zythological leanings may recall that I’m not overly fond of regular old Duvel. I find it unbalanced by excessive alcoholic fumes, even though I admit to admiring its velvety mouthfeel. But Duvel Tripel Hop is a different animal -- or, perhaps better said, it’s a more balanced beast. It counteracts the combustible cloud that rests atop the puffy head of regular Duvel with a whacking great lot of hop in both aroma and taste. The label speaks of “houblonnage extra intense”, and with my now wonderful French, I can tell you that means this beer has been resuscitated through intense extra hopping. Most importantly, I imagine, is the dryhopping with citra, which on top of the Saaz, Styrian goldings and more citra used in the regular brewing process, makes this a hop-lover’s delight. Citrus folds into florals, which passes into pines, and then pops into passion fruit. Terrifically complex and challenging, yet very drinkable at the same time. This beer is now being featured in Brussels shops as a new product for 2012, and it follows other recent experiments in hop-boosting by Belgian brewers, such as the single-hop limited editions from Delhaize and the still relatively new Chouffe Dobbelen IPA Tripel. All of these, if we’re going to be fair, really owe an in-country debt to the great Taras Boulba, one of my top ten Belgian beers, but of course, they have all have been keeping an eye on the long-term trends of increasing hopping in the US and UK, particularly the IPA hopsterism of the former, which was showing no sign of slowing down as far as I could see while in the US last summer. And yet, Duvel Tripel Hop is no IPA: its Belgian ale qualities shine through with a light sweetness and rich mouthfeel. You could never mistake it for anything but Belgian. It is a great fusion of the traditional and the new coming together, and I hope it takes off and inspires further experimentation. It has certainly inspired me to get back to writing this blog. First time I look in a while, and it's the day you're back. Good to see you here! I confirm ! Thanks to come back !